Looking for a place to have dinner and a drink before or after a movie at Raleigh Grande? Talk about your favorite parts of the movie or simply catch up with your friends at Lynnwood Grill & Brewing Concern, located just across Grove Barton Road. We offer a full menu and full bar — don’t leave without trying our very own house-brewed craft beers. It’s our microbrewery’s goal to create the best-tasting brews in the Northwest Raleigh area, so don’t miss out on our award-winning black IPA, dry stout and more the next time you’re at Raleigh Grande. Between our rooftop seating, fun calendar of events and weekly specials, Lynnwood Grill & Brewing Concern by Raleigh Grande is the place to be. We’re a great place to bring your family, hang out with friends or even host an event. 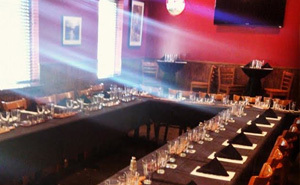 Ask us about reserving our private banquet room at no charge. We also provide catering for your parties, business meetings and more. 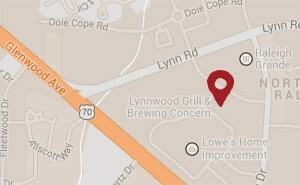 Feel free to contact us with any questions, and next time you need a place to eat near Raleigh Grande, choose Lynnwood Grill & Brewing Concern — don’t miss out on our drinks, food and fun! Located near Raleigh Grande, Lynnwood Grill & Brewing Concern offers specialty pizza, fun events, house-brewed craft beer and more.